2016 Colors of the Year - Thumbs up or down?! When the 2016 colors of the year were announced, they were not a complete surprise. While Benjamin Moore named Simply White as the color of the year, Pantone named two colors - Rose Quartz and Serenity - as their shades of choice. BM Simply White is used throughout the room in the image above - beautiful trimwork included! So, how do you feel about Rose Quartz?! Generally speaking, I think "pink" is one of those divisive colors. You either gravitate towards it, or you don't regardless of gender. I wrote about "pink" as a design trend awhile ago. It continues to be hugely popular in design. Rose Quartz exemplifies that shade of "blush" that I hinted at. It is a soft, warm, light pink hue that provides a sense of soothing calm and "playfulness" - at the same time. In contrast to the underlying warmth of Rose Quartz, the complimentary shade of Serenity blue incorporates cooler undertones. The soft blue hue also provides a sense of calmness and soothing comfort - as the name suggests. I think blue is one of those timeless colors that will always be popular in interiors and fashion. 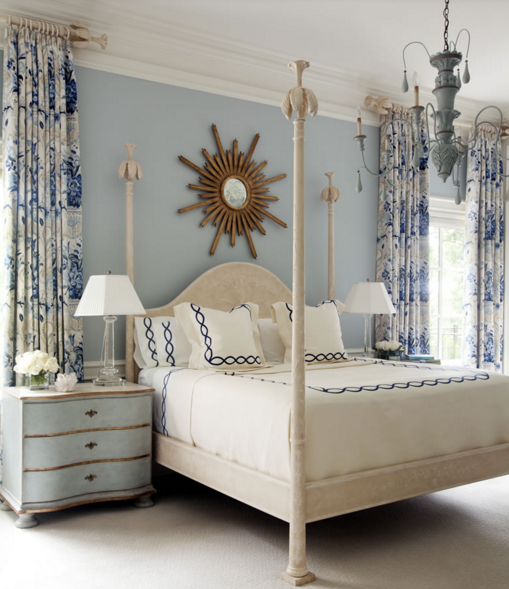 I especially like to use soft blues in bedroom designs to promote rest and relaxation. Personally, I would use Rose Quartz as more of an accent color. 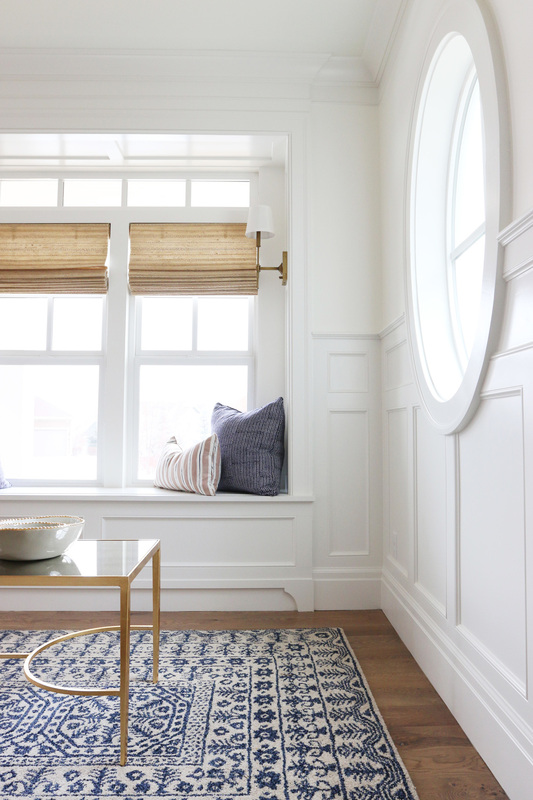 Serenity or Simply White would work well for the foundation of a room. The colors also work well in combination with each other. 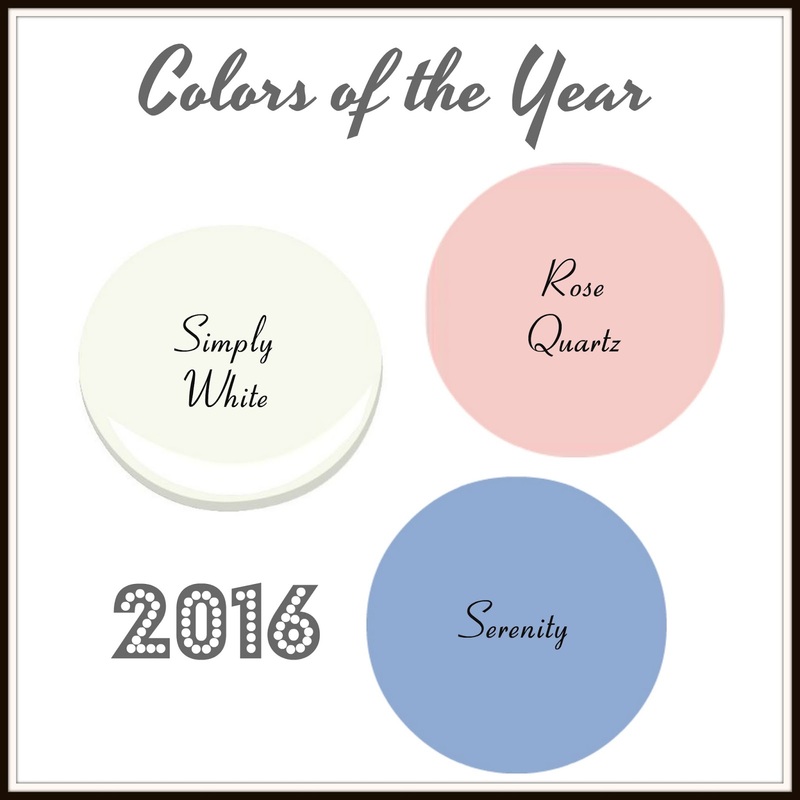 What do you think of the 2016 colors of the year? Yay or nay?! I'd give them "two thumbs up". Pink, blue, stay neutral white... It's a safe bet that one or all of the colors will appeal to everyone! Uh, I lean towards thumbs down. I like that white but baby blues and baby pinks, while lovely, are not the colors I gravitate towards this year. Thumbs up!!! My nails on my hands are actually rose quartz color and my toes were going to be the blue - mimicking the Pantone colors of the year. :) I love the colors!!! So subtle and classy.